Rachel Mumma, COE '18, reflects on her experience with the University Scholars Dialogue to Istanbul and Berlin. Standing in the Memorial to the Murdered Jews of Europe in Berlin, Germany is a surreal experience. From the outside, all that can be seen is a field of gray slabs, each the approximate width and length of a coffin. Looking out on a city block taken over by the equidistant stones feels like looking out on a field of graves, the gray contrasting strongly with the bright blue sky, reminiscent of bleak weather and dismal times. Entering the memorial, weaving through the stelae, the entire field of cinder graves can be seen over the rising slabs of concrete. As you wander further into the memorial, the stelae begin growing taller, and the ground slopes downwards until the memorial consumes its visitors. Shaded by the concrete walls, the hot sun disappears and is replaced by a slight chill, from either the lack of sun or the restless souls of the Murdered Jews. The rest of the city disappears; instead of traffic, only the distant voices of visitors inside the memorial echo from around the corner and down the hall. The stelae of the Memorial. Walking through concrete alleyways creates a feeling of being trapped, with only the choice to keep moving forward or go back. There is a cross section between walls every few feet, and down each alley there's either another empty hallway, or another person lost in the grid work of stelae and forgotten lives. Moreover, walking down a hallway at a steady pace creates an odd sensation as you pass from the cool shade of concrete into the hot sun and back again every few feet. Dark, light, dark, light switching back and forth constantly, like swinging between life and death. Each brief glimpse of sunlight, brightly lit hallway, or group of visitors is like getting a brief glimpse into a life left unlived, quickly snuffed out as you pass back into the shade of a concrete grave. The experience of the Memorial to the Murdered Jews of Europe is shaped by the space and previous knowledge of the devastation. 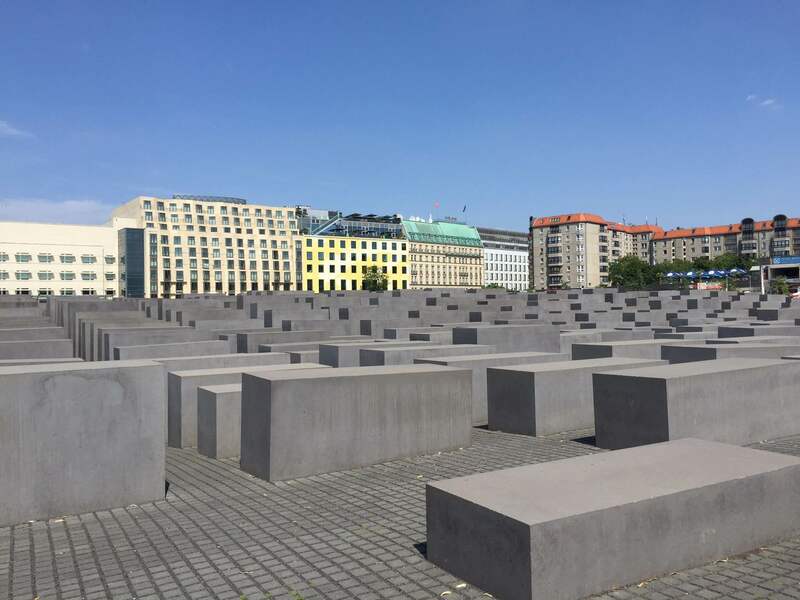 The evenly spaced, grave-like stelae look like mass unmarked graves, monolithic reminders of the huge loss of life during the Holocaust; many people were lost in the Nazi mass killings. Furthermore, the downward sloping ground and growing height of the stelae serve to isolate visitors from the world outside, simultaneously demonstrating the isolation of the murdered souls and allowing people to lose themselves in the memorial. The evenly spaced nature of the stelae makes everything look the same, just like the victims were stripped of their individuality lost themselves during the genocide. 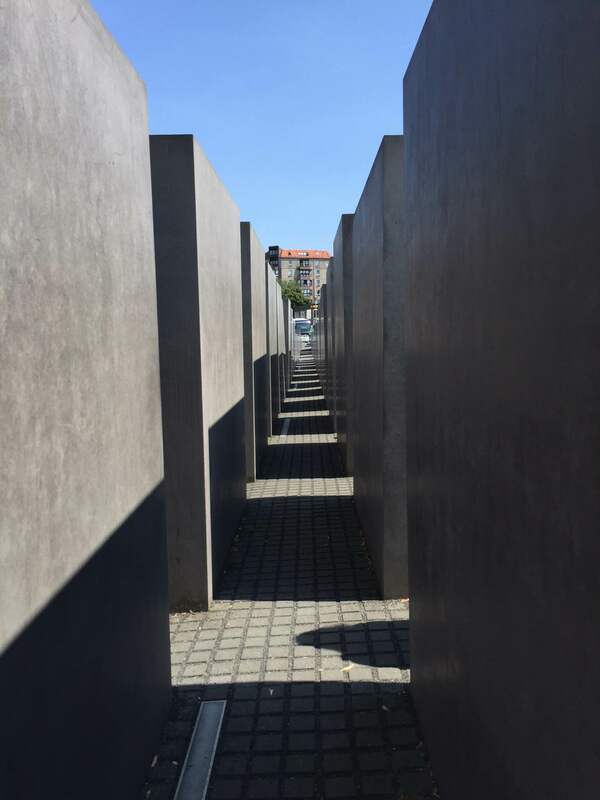 The gray slabs of concrete vividly remind visitors of the seriousness and gravity of the Holocaust's destruction. When I walked back out of the memorial, up the slope and into the sunlight, I was returned to the rest of the world both with a haunted sense of all that was lost with the annihilation of so many lives and a hope for a brighter future in the decades ahead. The memorial reminded me of how absolutely damaging a huge loss of life is for everyone, both those directly involved and generations born years later. 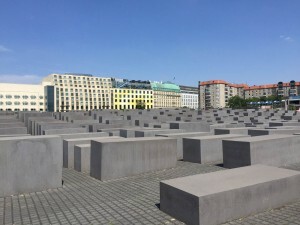 Yet, the memorial also served to reinforce how far Germany has come in admitting its failures and attempting to learn from its heinous past crimes. The memorial serves as testament to remind visitors of the Holocaust so no one will ever attempt such mass killing again.